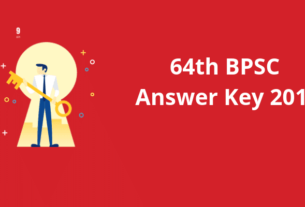 BPSC Admit Card for 64th Combined civil services examination has been released on 27th Nov 2018. The authority released on 5th December 2018, A notice for that candidate whose photo, the signature is not uploaded correctly, So these candidates need to take their passport size photographs along with him into the BPSC Exam Centers. They need to submit these documents to the conducting authority. In this year BPSC revised a total 1395 vacancy to fulfill various vacant post into the Bihar State Government Department. The authority previously released BPSC Exam Dates for Preliminary Examination. Candidates who are really interested in getting jobs or selection in this examination they need to apply for BPSC Examination. Through this article, Candidates will get a complete overview of the BPSC Examination like exam dates, application form, result dates, syllabus, and other important details. BPSC 64th Combined Preliminary Result has been released now, Click Here to Check BPSC Result. Interested candidates can apply for BPSC 64th Combined Exam 2018. BPSC Admit card has been released on 27th Nov 2018 and till available 14th Dec 2018. The salary is varied according to the various post under BPSC Recruitment 2018 i.e. Rs. 9,300 – 34,800/- + Grade Pay Rs. 5400/-, 4800/-, 4200/-. Salary can be changed or varied according to the commision. Candidates whose minimum age is 20, 21,22 Years as on 1 August 2018, were eligible to apply. Candidates whose maximum age is 37 Years (For General Male) were eligible to apply. Candidates whose maximum age is 40 Years (For Gen Female/ OBC/ OBC (Male/Female), were eligible to apply. Candidates whose maximum age is 42 Years (For SC / SC(Male/Female), were eligible to apply. The selection procedure is totally based on the performance of the candidates in the Preliminary Exam, Main Exam, and Interview. Only those candidates will get selected in this examination who get crack or clear all the process effectively or successfully. The preliminary exam is conducted via offline mode as well it will objective type or multiple choice question. The time duration allocated to the candidates would be 2 hours. A total 150 question will be asked in the examination which carrying 150 marks as well. Click here for Detailed Exam Pattern. Candidates who have successfully register himself for BPSC 64th Combined Competitive (Preliminary) Examination, are the only candidates who can download the BPSC admit card from the official website of Bihar Public Service Commission i.e. http://bpsc.bih.nic.in. BPSC Admit Card is available now, candidates can download it till 14th Dec 2018 after that no one can download it. The link will get expired after the date. The direct download link for the admit card is give above. The authority will conduct 64th Combined Competitive (Preliminary) Examination on 16th December 2018 via offline and will declare the result after one week of the examination or also declare the merit list for those who get selected in this examination. It is informed to the candidates they can check their result status through the official website of BPSC. once it will be released by the candidates then we will declare it here and inform you for the same i.e. the result for 64th Combined Competitive (Preliminary) Examination.